Better Products, Better Knowledge, Better Service, Guaranteed. Some of the quietest, most energy efficient, environmentally-sound products from the world leader in home comfort technology and innovation. Certified Carrier HVAC installers and technicians who have passed a comprehensive set of core and specialty exams to ensure their technical competency. In addition to being qualified to service other brands, they receive ongoing training specific to Carrier technology and products. A technical team that also strictly adheres to Carrier installation and service procedures and uses factory recommended replacement parts whenever possible to ensure your system performs as promised. Sales representatives who have attended Carrier University, a structured training program for learning how to better identify and recommend appropriate home comfort solutions. A professional Carrier HVAC dealer who actively solicits and responds to customer feedback to maintain an exemplary satisfaction score in Carrier’s proprietary customer satisfaction program. 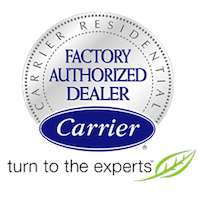 CARRIER is so confident that you will be comfortable – not only with your Carrier cooling & heating products, but with Cal Air Cooling and Heating, a Carrier Factory Authorized Dealer – that they back it up in writing with 110% satisfaction guarantee. If, for any reason, you are dissatisfied with your Carrier equipment within one year of the installation date, Cal Air Cooling and Heating will correct the problem or remove the equipment and refund your purchase price. Ask Cal Air Cooling and Heating for a copy of the guarantee for details and limitations. Looking for Carrier Furnace Dealers – Carrier HVAC Dealers – Carrier Parts Dealers – Carrier Air Conditioner Dealers? Cal Air Cooling and Heating is the top choice for Las Vegas!